BGP MED Attribute Configuration example BGP MED is an optional non-transitive attribute meaning its not propagated throughout the whole internet but just to adjacent AS. The word “optional” means that this is not necessarily by default sent with the BGP updates. The purpose of MED is to influence how other autonomous systems enter your AS to reach a certain prefix. If the other attributes are set to default, MED will be the attribute used for path selection however, if Weight or Local preference is configured on the adjacent AS router, then MED will not be selected. The lower MED is more preferred. 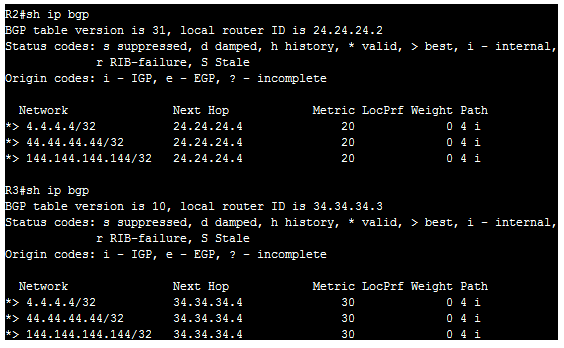 Acronym for Multi Exit Discriminator and otherwise known as “Metric” in the BGP table. The lower the MED the more preferred. It is an optional non-transitive attribute. Can dictate how other AS enter your AS. Configure R4 so that it will advertise a MED value of 30 to R3 and 20 to R2. Afterwards, tweak the route map to set a MED of 10 for network 144.144.144.144/32 in R4 towards R3. The end result should have traffic from AS123 to 4.4.4.4/32 and 44.44.44.44/32 take R2 but traffic for 144.144.144.144/32 should take R3. At the start BGP has been established on all routers. 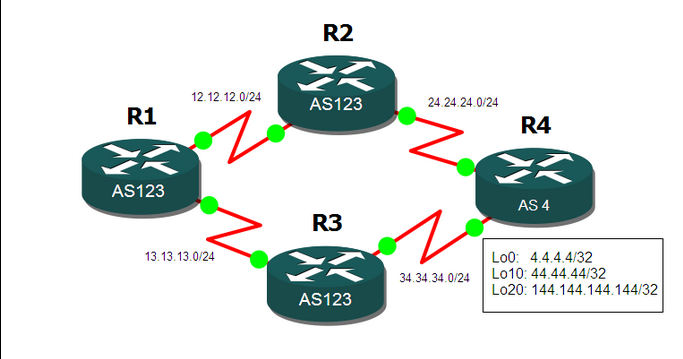 To start lets configure 2 route maps and set the MED as required. Access-list matches all routes. Now, lets apply the route map to the neighbors. Its in the “out” direction because R4 is the one advertising the routes. 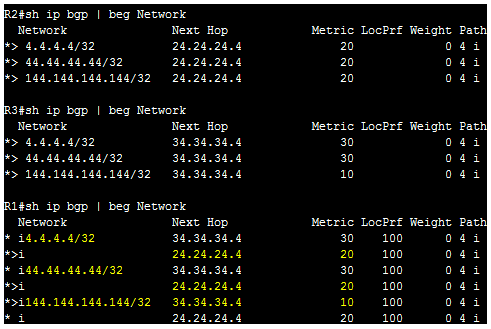 Let’s check what R2 and R3 see in their BGP table. Ok, its clear that the Metric now is changed to 20 and 30 for R2 and R3 respectively. Let’s see how R1 sees the routes. R1 sees two paths, but notice that the paths with “>” are with those with lower MED. Therefore it is going to take those paths. Now, lets configure R4 so that the path R1 will take to 144.144.144.144/32 in R4 will be through R3 then clear the BGP session after. Now, lets see the outputs. We can see a change in R3 that shows a MED of 10 for 144.144.144.144/32, while R1 shows the same and will now take R3 to reach the subnet.